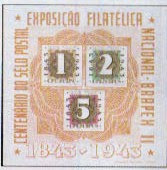 In 1943, Brazil celebrated the centennial of its first postage stamps by issuing a "Stamps-on-Stamps" topical souvenir sheet (Scott #C53) at the BRAPEX Philatelic Exhibition. Brazil was the second country (after Great Britain) to issue postage stamps , and the designs pictured on the souvenir sheet somewhat resemble the Brazilian "Bull's Eyes" issued in 1843. 20,100 sheets were issued, and Scott '10 prices it at $ 50.00 for unused. With 191 million people, Brazil is the largest economy in Latin America, and the world's eighth largest economy. Political and economic reforms have given the country a brighter future than it had in the bad old days of oligarchical dictatorship. The Brazilian economy is diverse, the country is aggressively investing in its future by generously funding technological research and education, and exports are booming. Annual GDP growth has averaged a little over 5% over the last 5 years. 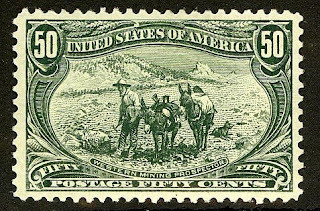 There are a number of grossly undervalued Brazilian issues with printing quantities of 10,000 to 100,000, some of which have topical appeal, and recommending them for accumulation seems a no-brainer. Brazil looks destined to become an economic superpower, and even if it mirrors the philatelically anemic U.S. and only one out of a thousand Brazilians become serious stamp collectors and one out of a fifty become "unserious" ones, they'll be competing for their nation's better stamps, only to find that the cupboard is bare. General Commentary: The Topic is Topicals!